Shakespeare gave Queen Margaret more lines than any other female character, and more lines than King Lear. Now, she's finally been given her own play - one of two productions putting the Bard's women centre stage. A marketing email from the Royal Exchange theatre in Manchester recently proclaimed that it is staging the "world premiere of a new Shakespeare play". "It is like she's been lying there in plain sight for 400 years, but nobody has reached in and assembled her before because she is scattered across four plays," says playwright Jeanie O'Hare. "To me she's really obvious - she's there staring back at us." Image caption "If Shakespeare was around now, he would totally be up for it"
The remarkable and ruthless Margaret of Anjou appears in Shakespeare's Henry VI parts one, two and three, and in Richard III. To create the new play, titled Queen Margaret, O'Hare has added lines of her own to connect Shakespeare's existing scenes. The final script is about half Shakespeare's and half hers, she estimates. "There's something wonderful about working with Shakespeare's texts," she says. "But it feels like a shame that women feel under-represented a lot of the time, and for the most part they are stuck in domestic and romantic roles. "As a woman, you grow up and you see Shakespeare plays and you notice. You notice that there are not many roles and amazing speeches. "When you then have a chance to shift the focus, you do, and this is a wonderful way to move with the times." But perhaps it tells us a lot about his time that he didn't see fit to write a play called Queen Margaret. And it tells us something about our own era that she is being put in the spotlight now. "Totally," Anouka agrees. "There are no plays with a female name [in the title] unless they're with a man - Romeo AND Juliet. Antony AND Cleopatra. And the men come first. "I think it's definitely something of the time. But I feel like if Shakespeare was around now, he would totally be up for it because he liked the character." In real life, Margaret married Henry VI in 1445 and ruled in place of her ineffectual husband. Her battles to secure their son's right to the throne put her at the heart of the Wars of the Roses. Her reputation through history has been largely shaped by Shakespeare's description of the "she-wolf of France". Given the lengths of his history plays, though, many of her lines are usually cut. Jeanie O'Hare had the idea to put Margaret in the spotlight while working as the Royal Shakespeare Company's first female literary manager at the time when the company put on the Bard's epic history plays in full a decade ago. She says: "We don't see her on stage that often, but when she is performed, we'll see the bitching scene with Duke Humphrey's wife, we'll see her killing York savagely at the Battle of Wakefield, we'll see a moment of infidelity and we'll see the moment when her son dies. "And it's like a bad Match of the Day edit - if you reduce her down to those edited highlights, then she is quite an unsympathetic character and quite irredeemable. "But actually if you read all of those lines that Shakespeare wrote for her, there are a lot more colours and textures to his characterisation of her, and I've tried to be true to the woman he was writing and not to try to impose a retrospective contemporary view onto her." 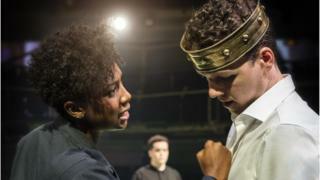 At the same time Queen Margaret is at the Royal Exchange, a play called Othellomacbeth is also putting the spotlight on Shakespeare's female characters down the road at Manchester's Home theatre. "I had a lot of thoughts about what it means to direct Othello, which is essentially a play about a man who murders his wife," Christian says. "I knew that I wanted to go into Othello - not to rewrite, but I thought it would be interesting as a blunt instrument to remove all the scenes that didn't have women in them. "I wanted to see what it would be like for the audience to see the story through the eyes of Desdemona, who has so little information about why what's happening to her is happening to her, and why this man she was completely in love with has suddenly turned on her for, as far as she can see, no apparent reason." Audiences will get a clearer view of how she "tries to engage with him" rather than being a passive victim. Meanwhile, the same process means Lady Macbeth becomes more human, Christian believes. And the director connects the two plays by suggesting a link between the women in Othello - Desdemona, Emilia and Bianca - and the three witches who seem to have a grudge against mankind at the start of Macbeth. It's coincidence that there are two productions focusing on Shakespeare's female characters in the same city at the same time. But they are both tapping into a desire to shift the perspective in the stories we tell. Christian says: "There is an increasing desire on the part of a lot of people to look at sections of the population who feel like they have been unrepresented in the history and the culture of our country. "And [we want] to look at the fact that we reinforce that downplaying of people because we keep performing plays by the same voices with the same characters and the same gender disparities over and over again." "It's about recognising that the world keeps moving onwards and it's exciting to keep taking things and reinvent them, not just to either stop performing them or to freeze them in the past."